Killer Characters: How Did I Get Into This? It all started with donuts. I like making them. The police officers at the Fallingbrook Police Department like eating them. Somehow, I started making birthday cakes out of stacked-up donuts for kids' birthday parties, and the next thing I knew, I was owning a donut and coffee shop along with my father-in-law, Tom. He had retired as Fallingbrook's police chief. Since we're only a few blocks from the police station, it's not surprising that police officers come to our shop, Deputy Donut, for their breaks. Other people flock in, too, and it was a real shock when Georgia, one of my favorite customers, was murdered. I did not mean to tamper with the crime scene. I know better. My late husband was a detective, I worked for awhile as a 911 operator, and one of my best friends is a cop. All I can say in my defense is that I hoped I could save Georgia. 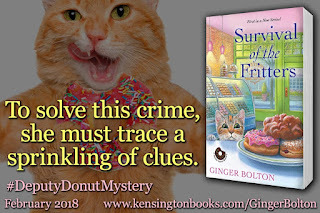 And then, thanks to my cat, who is also named Deputy Donut (she had the name first), I ended up in more of a tangled mess than I could have foreseen. If you had to create a kids' birthday cake out of donuts, what would you make? The easy one (for me) is a rocket ship. 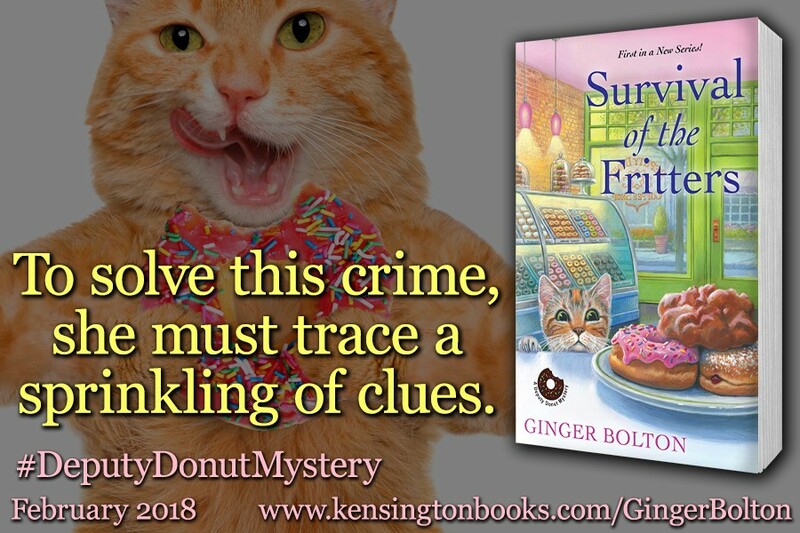 Comment below for a chance to win a copy of Survival of the Fritters. 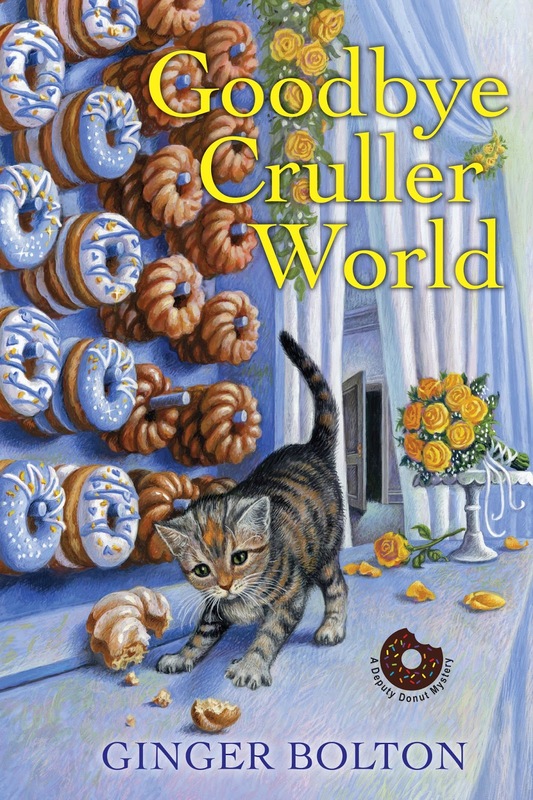 Goodbye Cruller World, the second Deputy Donut Mystery, will be on store shelves in September 2018 and can be pre-ordered now. Read it - LOVED it - definitely recommend it to anyone that wants a great read! Thank you, Traveler. A cowboy would be quite a challenge. I think I would make the Leaning Tower of Pisa. Thank you so much for the chance to win! LOL! That's how my rocket ships would probably end up! That idea might end up in a book. Thanks, Abby! A castle with lots of turrets! The rocket ship is a nice idea. Keying the shape to the birthday person's likes is key. But I'd make the shape out of something not donut. Then use something peg-like to hang the donuts on it. That way they are easily removed without destroying the basic design. A surfboard. That might be easy enough that even I could make it. I think I'd try to make a big beach ball---or maybe make the number of the birthday being celebrated. Those are fun ideas, too, Sue! That would be cute, Dianne! That could be quite a challenge, Jana Leah B. You could build a castle. Lots of lovely donut towers. How about a snowman with different sized donuts, or use mini fritters to make a Lego creation...I am do looking forward to reading this, and meeting Deputy Donut. Love orange kitties. jeaniedannheim (at) ymail (dot) com Thanks for the chance to win! Ooh, a snowman--what a good excuse to coat donuts in shredded coconut! An old-fashioned locomotive, maybe, with a smokestack! How about a teddy bear, maybe a couple of teddy bears? Actually what came to my mind first was a Christmas tree. But that's not a good idea for a kid's birthday party! This sounds like a fun series. Looking forward to reading the first book! Teddy bears would be adorable, and a Christmas tree would be great for a Christmas party! I have a granddaughter, my first thought is a castle incorporating ice cream cones for the spires. And then warn party attendees, "Donut try to drive it." A lighthouse would be perfect. And how wonderful that you work for 911. I hear it can be heart-wrenching. I hope that doing so much good for others helps make the pain easier to bear. Random.org chose Autumn Trapani as the winner of a copy of Survival of the Fritters. Congratulations, Autumn!